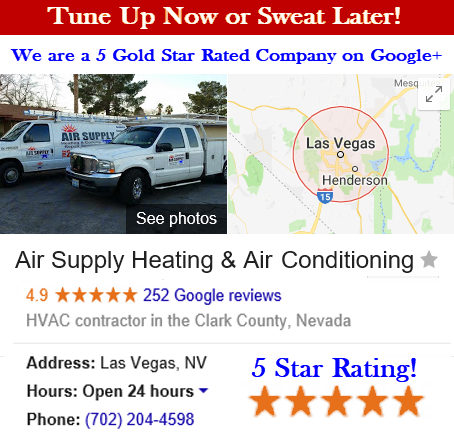 Air Supply Heating and Air Conditioning is a full service HVAC system company that caters to the commercial businesses and residential homes across the Las Vegas, Nevada Valley. We are completely licensed, certified, bonded, and insured to provide our professional expertise and services to the community. We continually strive for customer satisfaction by not only delivering superior workmanship but incorporating friendly customer service, traditional values, high morals, and exceptional work ethics into every service we perform. Air Supply Heating and Air Conditioning technicians are more than qualified to tackle any service we offer with training, experience, and skills. 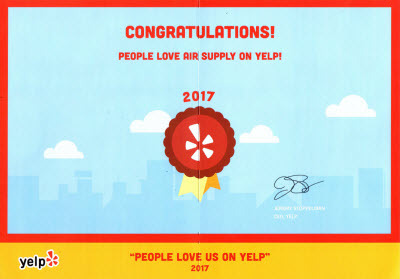 Additionally, at Air Supply Heating and Air Conditioning we utilize high-end products and equipment available only to licensed professionals to ensure our customers receive nothing less than quality. 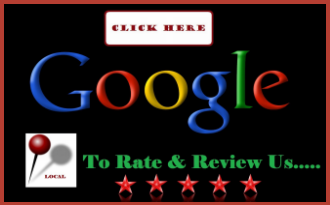 –	Air ducts, filters, blower and indoor coils are checked for dirt and other obstructions. –	Any duct leakage id diagnosed and sealed. –	Airflow measurement is confirmed adequacy. –	Refrigerant charge is verified. –	Refrigerant leaks are checked if levels are inadequate. –	Inspect electric terminals for buildup, loose connections, and efficient coating; cleaning, tighten connections, and apply nonconductive coating as needed. –	Motor’s belts are inspected and lubricated. –	Verify correct electric control; for example ensuring the heating is locked out when the thermostat calls for cooling and vice versa. During the heat pump inspection performed by an Air Supply Heating and Air Conditioning of Las Vegas expert, we meticulously check wires and plugs for any signs of corrosion or damage as trouble with the electrical can contribute to additional issues. The condenser coils and the heat pump’s coils are other important components that need to be cleaned and free from buildup. When dirt, dust, and other debris accumulate, the efficiency falls. If the heat pump has to compensate, additional wear will occur, increasing the likelihood of repair and increasing energy costs. On top of professional cleaning during inspections and maintenance, it is recommended to keep it maintained. During our inspection the heat pump’s insulation is meticulously inspected for damage, inadequacy. To keep your Las Vegas home’s heat pump operating at peak performance, be sure to avoid storing garden hoses, landscaping equipment, boxes, and any other clutter on top of it. Doing so will make the system work harder, putting a strain on the unit causing unnecessary damage. In addition to not storing your possessions on top of the unit, keep the clutter from being stacked in two feet proximity to ensure it has accessibility for your technician and to keep the unit from overheating. You heat pump requires proper air flow to contribute to the overall efficiency, periodically inspect the unit and clear away any dust, dirt, and debris that might be accumulating around the unit as well as keep grass trimmed and bushes hedged that is encroaching on the unit. With Air Supply Heating and Air Conditioning performing an annual heat pump inspection in your Greater Las Vegas, Nevada home or business and taking the care it needs, you heat pump can last longer than the projected life expectancy, operate at high efficiency, and minimize the need for repairs. 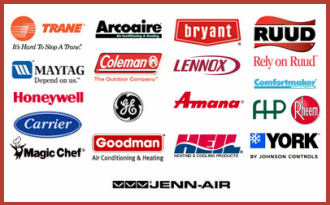 Call Air Supply Heating and Air Conditioning today and let our experts perform a heat pump inspection to reap the benefits.